Appearance (0-20): Casa Magna hits another home run with the appearance. If you saw my Oscuro review, it got a perfect score. Looks like this one will run about the same. The jalapa wrapper is apparently something different than what Casa Magna generally does. It appears very nicely wrapper, with some small veins running down it. The brown wrapper has an oily feel, with the cap being wrapped up in a pigtail. There is also a new band for this limited edition smoke that is nicely done. Construction (0-20): This is a box pressed cigar, which is a favorite of mine. It is very well packed from cap to foot. Upon lighting, the cigar smoked cool and even right down till the end. 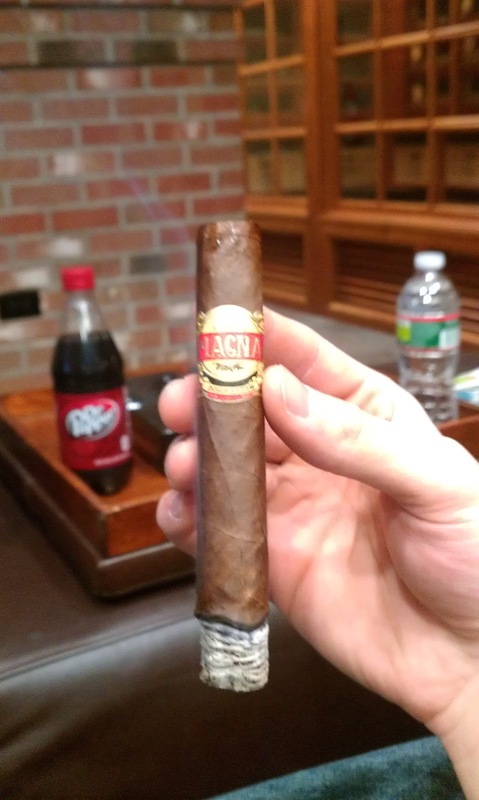 I was very happy with the draw (displeased with the oscuro) as it pulled nice and easy, and gave off great smoke. The ash was white-gray, and held on for about ¾” before I tapped it off. Everything comes together perfectly when a cigar is constructed properly. Strength (0-20): I believe this was classified as a medium-full cigar, and they hit the nail on the head. Any stronger and it would hit you, and lighter and you would feel wanting more. Perfect strength and flavor combo with this one. If I had to choose, I would say it moved closer to the full scale. Flavor (0-20): Now this is what I think of when I see a Casa Magna band on a cigar. Flavor, flavor, flavor. This reminds me a little bit of the Casa Magna Colorado, but the flavors are definitely different. The initial light gives off some small spice, mainly a woody spice. Then as you progress through the cigar, you deviate through different profiles. You’ll get some chocolate, woodiness, spice, and fruity sweetness. This was one of the most complex cigars that I’ve had in awhile. Value (0-20): For $9.00, this is a solid smoke. I don’t have any gripes with the pricing here, but I’d definitely like to try the large size. I think that is because I didn’t want the cigar to end. If you can’t stretch for a box, grab at least one for yourself to enjoy this gem. Additional Notes: Paired with a Dr. Pepper and smoked at CI. Overall (0-100): I’ve been smoking for about 5 years, and I have never purchased a box of cigars. I tend to buy sampler packs so I can smoke different sticks and find things that I really like. With only 5,000 boxes being made, I’ll be looking to get a box quickly. The flavor profile is outstanding, and they won’t be around long. If you like the Casa Magna Colorado, run to your B&M and buy this.